Thoran,a dry delicious side dish with coconut, is highly privileged to be a part of traditional Kerala Sadya.Thoran can be made using different vegetables ,but in my place we prepare only Cabbage Thoran for Sadya.A combination of vegetables can also be used to prepare thoran. Here’s my cabbage thoran recipe.. Grind grated coconut,turmeric powder,green chillies,jeera seeds and garlic into a coarse paste.Mix together cabbage ,salt and the ground mixture well with hand.Keep aside. 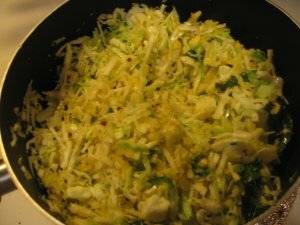 Heat oil in a pan and allow mustard seeds to splutter.Add in urad dal and curry leaves and fry for a minute.Now add the cabbage into the pan and mix well. Cover it with a lid and allow it to cook in medium heat,stirring in between.You can add little water if needed,too much of water will always spoil the dish. 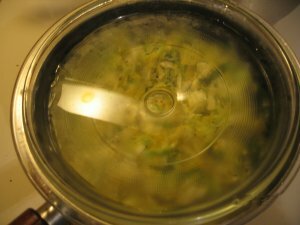 Following my amma’s method,I don’t add any water to the cabbage ,but i cover the cabbage with a lid or a plate which contains some water.And due to the moisture,water droplets forms under the lid,will drip into the pan in regular intervals,which prevents cabbage from sticking to the bottom. When the cabbage is almost done,add crushed chips,mix well and simmer for 3 more mts. Serve with rice. This entry was posted on September 1, 2006 at 9:11 pm	and is filed under OnaSadya, Traditional Kerala Dishes, Veg Dishes. You can follow any responses to this entry through the RSS 2.0 feed. You can leave a response, or trackback from your own site. Adding crushed chips to cabbage poriyal is a very diiferent one. I am going to try this out the next time.. Thanks for the recipe. Crushed chips enhances the flavor, huh? I’ll sure try that out. thanks annita. Thanks Rg,Onam evide vare aayi..
Hope you are doing well. I just had a question. When I make thoran with green beans, do i follow the same recipe for grinding the paste…as in cabbage thoran? or is there any difference? pls letme know ASAP as i plan to make it tonight)Thanks a bunch dear. Yeah Bindu,you can follow the same procedure.If you are short of time,u can even omit the grinding part.Just throw in all the ingredients,that’ll also work fine. Thanks Bindu.Did it turn good for u? it came out great…thanks a ton! Just wanted to ask you something. I have been looking for an authentic “Puliyogare” recipe..or tamarind rice as some call it. i came across some..but not the authentic kind. Can you tell me if you have the recipe, or someone else you know has one? would really appreciate your help. Me and my husband love it. will wait for your reply as always. Thanks a bunch dear. Thankyou Annita. IT does look good to me too:))Appreciate your help. I’m a regular reader of your blog. I’m married to a malayalee and have a blog about Kerala cooking (part of it) in french, transmitted my mother in law mainly. 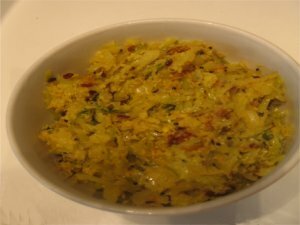 I just posted a cabbage thoran and I have a question about the jeera. I’m almost sure that in my family in law they use fennel seeds (perumjeeragam) for thoran, but I see many recipes with jeera, or cumin. Can it be anything or is there a confusion? Is cumin widely used in Kerala (I’ve never tasted it in our family dishes, it’s always perumjeeragam, but i know how the local cookings are different ! ;) ) ? Thank you for your recipes that are really inspiring for me !